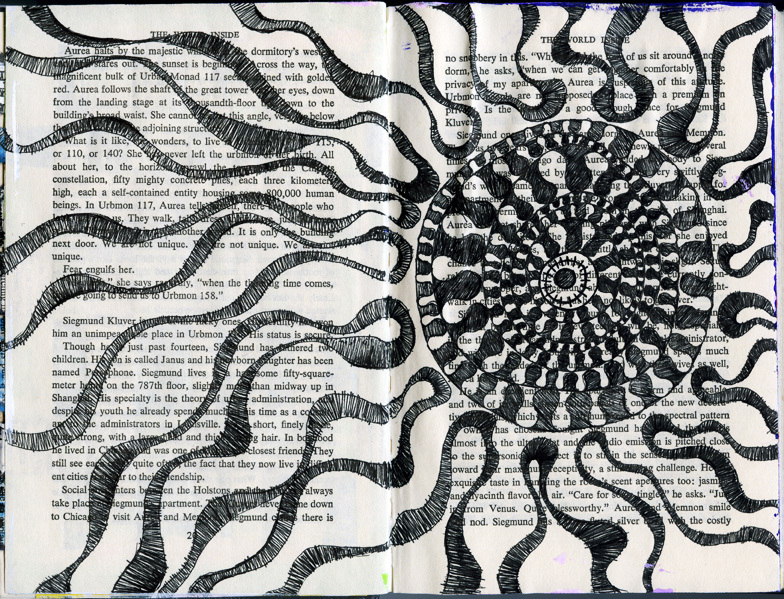 Pen and Ink drawing from altered book series. On January 1st,friends and I got together to begin an altered book project. The idea was to begin the year by setting a tone for creative fortitude across the next 365 days. The people who attended each picked a book,already full of text,some containing pictures,diagrams,recipes. There were dictionaries,cookbooks,books of obscure science fiction,board books for little hands. The book I chose is a thin,compact,hardback,bound well,with fibrous,absorbent paper (and kind of pulpy,like coarse,heavy newsprint). I thought it would do well with ink,markers,fat Sharpies and dye. I decided to cut out every fifth page,(thereby removing one fifth of the book),to make space for the addition of glued-in goodies. I just love simple pen and ink. This drawing was done using a Micron,and quite satisfying to make–lots of simple curves and hatch-marks.